The year 2014 was something of a tumultuous one for police officers in the United States. Several high-profile incidents involving the deaths of unarmed men following police uses of force sparked protests and riots across the country. 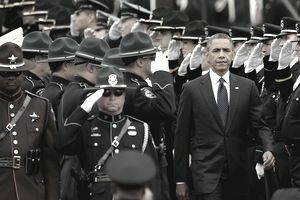 In response to the increasing sentiment of distrust against law enforcement, President Barack Obama was compelled to convene a Task Force on 21st Century Policing. President Obama signed an executive order to form the task force on December 18, 2014. The task force was made up of representatives from law enforcement chiefs, police unions, police training officers, community leaders, youth activists, and university professors. The task force held seven listening sessions in cities across the United States. During the sessions, they heard from members of the communities to learn how to work towards greater reductions in crime, while at the same time restoring trust in law enforcement. The task force was asked to provide a report within 90 days of forming. The group issued its final report in May of 2015, just two months shy of the 50th anniversary of President Lyndon Johnson's own President's Commission on Law Enforcement and Administration of Justice. President Obama's task force produced specific action items in 6 topic areas that the group called pillars, as well as two broad recommendations that called for the establishment of a permanent National Crime and Justice Task Force and support for crime prevention programs that incorporate addressing poverty, education and health, and safety issues in communities. The task force recommended that police officers adopt the guardian concept of policing, in contrast with the idea of the officer as a warrior. They emphasized the importance of accountability and transparency in police actions and engaging in activities other than enforcement that can promote a positive image of law enforcement. The task force suggested that police departments ensure that their policies reflect the values of their communities and that specific policy address issues like the use of force, public demonstrations, and de-escalation. They also recommended peer reviews of critical incidents and external, independent investigators assigned to questionable uses of force and in-custody deaths. Technology offers tremendous potential for police departments to better interact with their communities, increase transparency and accountability, and improve safety and security for civilians and officers alike. The task force strongly suggests maximizing the use of technology to improve how police do their jobs on a day-to-day basis. Policing a community requires involvement and engagement with the community. The task force recommended that police departments recommit to community-oriented policing strategies to improve community relations and take a more holistic approach to address crime. The task force encouraged the federal government to foster partnerships with training centers across the country and facilitate more consistent training and standards. They also recommended forming training hubs to encourage innovation, community engagement in training and a national postgraduate institute of policing. Police work is inherently dangerous and can even be potentially hazardous to officers' health. The task force recommended implementing "scientifically supported shift lengths" and building on research into officer-related deaths and critical injuries. Just as circumstances demanded a change in policing tactics in President Johnson's day, the environment in 2014 required a new way to address how law enforcement approached their communities. In time, through the recommendations of the task force and other law enforcement and community leaders, police may be able to return to their original principles.